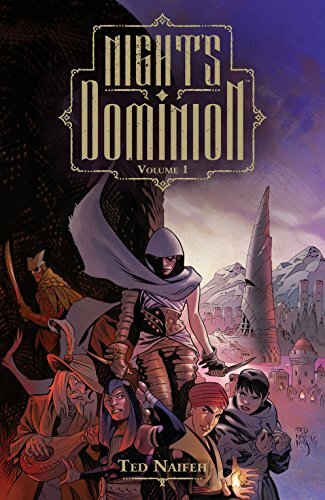 Night’s Dominion Vol 1 contains great artwork and an interestingly imagined medieval world. However, the plot contains a rather generic revolution story reminiscent of Les Miserables. Emerane is a master thief. When she and a band of other rascals led by a minstrel take on the cult of Uhlume, violence ensues. The cult is composed of skull-headed beings, who run the town of Umber. This book has a rather standard sword and sorcery rich vs. poor quest plot that is wrapped up well by the end. Some of the best elements are presented during the rousing conclusion so I’m looking forward to the next volume. The artwork is attractive with a good use of color and crosshatching in the background to add dimension and impact to each scene. Ironically, my favorite part is the tagline on the back of the book, which I’m sure will entice many other readers to buy it. A solid 3 star read. It is also available on Comixology Unlimited.